When we did our games over the holidays I was realizing that the French cavalry are at a bit of a disadvantage. I could put out 8 squadrons of Danish cuirassiers and 8 squadrons of Dutch and Allied dragoons. On the French side I could only muster 13 squadrons. It’s not that big of a disadvantage, but I had the lead for another regiment of French, so I added Rosen Allemand. 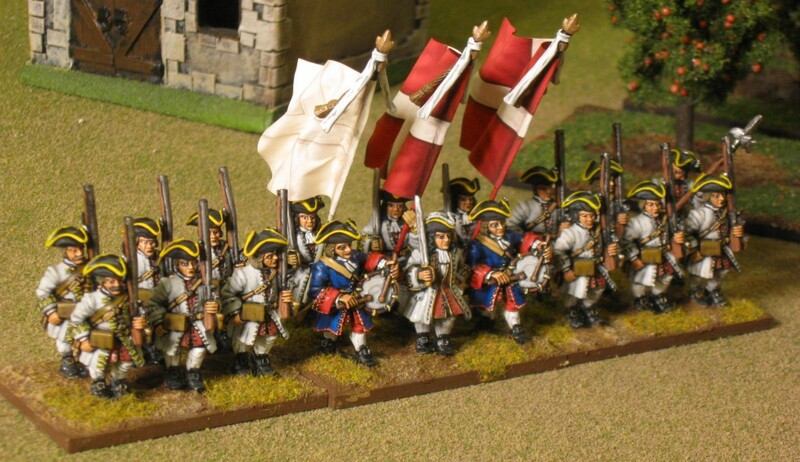 I painted Royal Cravattes fairly early and it was brigaded with Rosen Allemand at Ramillies, so I decide to finish the brigade. Most of my focus from now on is going to be the forces that fought in the village (for infantry), and between the village and the Mehaigne. I purchased some more French cav, which will now put the Allies at a disadvantage for awhile. Well, when I get the French painted. So far most of my French cavalry is blue. These are blue with red facings. The royal cavalry regiments are blue (I used royal with them) with red facings. It kind of blows up my stereotype of everything being white with red (a color combination I love). As usual the figures are Front Rank. The flags are from GMB designs – the generic green French cavalry flag. This entry was posted in French Regiments. Bookmark the permalink. Well, a lot of those have been done for awhile and I’ve just added the flags. It feels good to be back to it. And some of the locals are asking how to get in a game with the figs. All promising.